When was the last time you had an epiphany in your audio life? Something that put a rift in your paradigm shift? A real game changer, like ping pong to rugby? I had one just a couple weeks ago involving the Inuos Zenith MkII server and the Aqua La Scala MkII Optologic DAC. Around 2015 I started trying to use computer files at shows so as to not appear outdated as buggy whips, but feeding my MacBook Pro through an SP/Dif->USB converter and on to the Red Book DACs was inconvenient as hell and seriously unsatisfying, uninvolving, all too easy to ignore in favor of either vinyl or CD. For the last year or two, I’ve tried to get interested in music servers, but reading about server this, end point that, network bridges, power supplies, exotic Ethernet cable, etc, made my eyes glaze over, followed by pitching forward into my laptop. Now, I started with computers in the punch card and acoustic phone coupler modem period, serving as a teaching assistant in a grad level Computers in Communication course at BU, so it’s not like technology overwhelmed me; I just wasn’t interested in running a Higher Ed gauntlet for the privilege of playing music. Then, in the last couple of months, several dominoes fell over in rapid succession. First, I bought an Innuos Zen Mini server to use at home. The promised ease of use was really my entire motivation. That part was well satisfied. Import a CD? Load it into the slot. The Mini will convert it to FLAC, scoop up metadata, note titles, etc, organize it into your onboard terabyte library and spit the disc back out when it’s done. Roon is an easily implemented option, (although Innuos’ proprietary library system is very good), TIDAL is at your fingertips, and you select your music via your smart phone or tablet and wifi from anywhere in the house. If it finds something weird about a disc during importation, the Mini puts it in quarantine where you can review and correct it later. 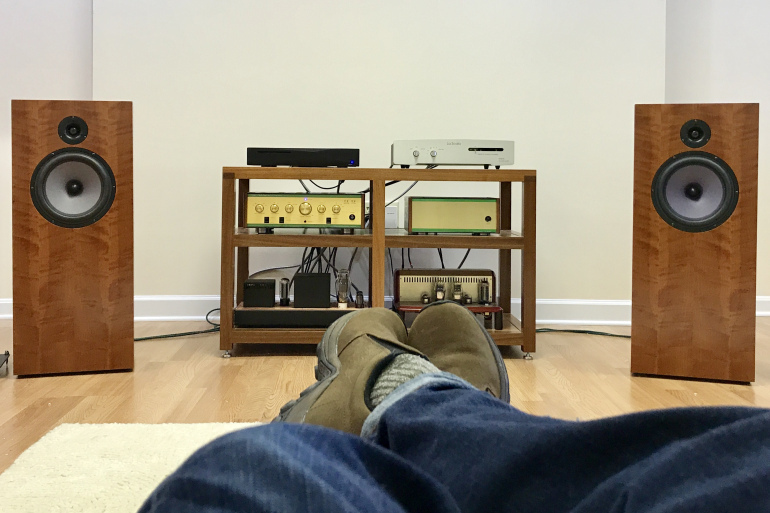 I was taking an absolute minimalist path at home: the Mini fed the internal DAC in my Cambridge Audio integrated, which then propelled signal along 30 year old zip cord under the carpet to a pair of ancient Snell Type K speakers sitting on the floor. Eek! Still, what I heard told me that the Mini was providing clean, clear punchy signal to the DAC/amp combo. The Mini beat out my MacBook Pro on musical points and thrashed it on ease of use. Two thumbs up, but for the Forge, I wanted more. So I bought the ZENith Mk 2. Goodbye switching, wall wart power supply; hello linear power supply with ultra low noise regulators, Nichicon MUSE caps and medical mains filter. Dual ethernet ports with isolation transformers. Fast, silent SSD storage. Quad core Intel CPU, 8GB RAM, 4GB in-memory playback. Ultra low noise USB output. Yum. Contemplating all this plus a purpose-designed OS, I begin to see why a tricked out, kludgy laptop might not be the best solution anymore. While the ZENith sounded wonderful with various DACs feeding the Leben CS-600 integrated amp and DeVore Fidelity O/93 speakers, the penny – no make that a pound coin – really dropped when I received the Aqua La Scala MkII Optologic DAC. But the reason it’s never leaving is the resulting sound and what it does for music. 50 hours in, this combination is hypnotic, immersive, compelling, detailed but not etched or edgy, punchy but liquid, PRATty, then languid by turns, swinging, swaying or marching as required by the music. These 2 boxes contain a world of clever tech all slavishly devoted to music. Will they replace my analog sources? No. Am I spending a lot more time exploring on TIDAL, browsing and buying on HDTracks and enjoying it all on a deeper level than I ever expected? Yessir! By the way, you are cordially invited to Old Forge Studio to hear what I’m struggling to describe!